I'm sure most crafters would agree that their products are in a constant state of evolution. As your processes improve, or you learn something new, your products improve as well. Candles are no exception, and I'm constantly learning as I go. Last year I started developing some larger versions of the popular 'mini teardrop' candle. As I was working on these, I realised a few improvements could be made to the original version to help it burn for longer. I made a few prototypes, and did some tests, to discover that they worked best when made 20% larger. So I decided to name this new size the 'small teardrop', and to phase out the mini size, as it wasn't very economic to produce. 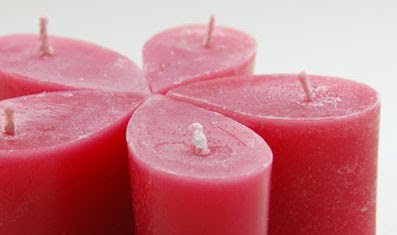 The good news is that the new candles burn for approximately 16 hours, which is about four times as long as the original size. They are currently available at an introductory price of $10 each. This is only a $2 increase from the mini size, and you get a 20% larger candle which lasts four times as long. If you have been eyeing up the mini teardrops for a while now, they are now half price while stocks last. That means a set of 5 is only $20! Get in quick though, because once they are gone, there will be no more. I love the tear drop candles! Thank you Hannah! It's always lovely to hear feedback about how my candles go after I've sold them. That's very interesting - 20% bigger burns 4 times longer and only $2 dearer? Could a customer get better value? I don't think so! !